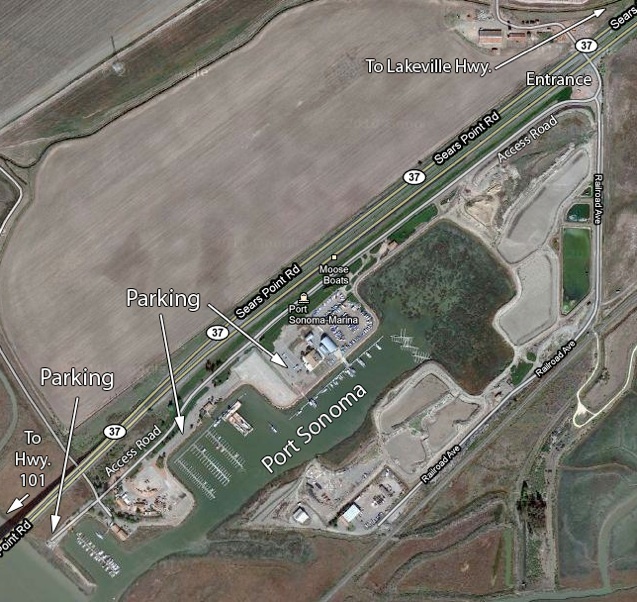 Location aliases: Generally referred to as Port Sonoma or Port Sonoma Marina. Port Sonoma may also be used loosely for any of the immediately surrounding areas. This is the southernmost part of Sonoma County. Location: Entrance is via a turnoff from Hwy. 37 (marked on the map here as "Sears Point Rd.," although I have never heard Hwy. 37 referred to by that name locally). There are small signposts for Port Sonoma. Enter and turn to the right, following the access road that runs parallel to Hwy. 37. You can park in the Port Sonoma Marina parking lot, at another lot further along the road (signposted "Public Parking") or at the extreme end of the road, where there is room to park at the dead end overlooking the water near the mouth of the Petaluma River. Hwy. 37 can be reached from the north, via Hwy. 101 (off the map here to the left) or via Lakeville Hwy. (off the map to the right). From Hwy. 101, use exits marked for Hwy 37. Lakeville Hwy. ends at Hwy 37 at a T-junction (its southern extension is Reclamation Rd. GPS address: Port Sonoma Marina's official address is 270 Sears Point Rd., Petaluma, CA 94954, which may be correct in most GPS units, but some databases may list it as 270 Hwy 37 (to be confirmed). GPS Coordinates: The Port Sonoma Marina parking lot is at 38.1191N, 122.4987W (or 38 07 09N, 122 29 55W). The intersection of Hwy. 37 and the road that enters the marina area is at 38.1242N, 122.4921W (or 38 07 27N, 122 29 32W). Access: There is public parking in two parking lots near the Marina. At the far end of the access road (a dead end) is another small parking lot. Technically, the Marina parking lot is for users of the Marina, but no one seems to mind short stays for bird watching. Recommended route: Park at the Port Sonoma Marina parking lot and walk behind the buildings to scan the water in the port itself. This is a good spot for grebes and ducks in the winter. There is a trail to the left that allows you to approach the marshy areas adjacent to the marina proper (clearly visible on the map). The marshy areas can be excellent for shorebirds, especially in the winter months. From here, return to your car and drive to the very end of the road for views over the end of the Petaluma River near where it dumps into San Pablo Bay. Water is visible also from the public parking area between these two points (the marina and the dead end), but the marina and the dead end are usually more productive. Restroom facilities: Restrooms available at Port Sonoma Marina. Restaurants nearby: Not a lot in the immediate area. There is a Starbucks at 3100 Lakeville Hwy. (775-3708) for the basics. Otherwise, Petaluma (further to the north) is probably the best bet for lunch. My favorite in Petaluma has long been the Water Street Bistro at 100 Petaluma Blvd. North, Petaluma, CA 94952 (763-9563). Small, but delicious. Lombardi’s Barbecue (3413 Petaluma blvd. North, Petaluma, CA 94952; 773-1271) has excellent sandwiches. Try the pulled pork sandwich. Ask for your cole slaw IN the sandwich. Yum. 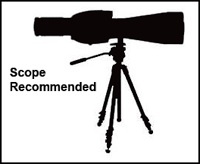 Related bird watching spots: The closest birding spots are at Reclamation Rd. and Skaggs Island Rd. See relevant pages for details. Shollenberger Park is about 20 minutes north of Port Sonoma, in Petaluma. Adjacent to Shollenberger Park is Ellis Creek Water Recycling Facility. On the opposite side of Shollenberger Park from Ellis Creek Water Recycling Facility is Alman Marsh. See the pages for Shollenberger Park and Ellis Creek Water Recycling Facility for details. Further afield: To the east is the San Pablo Bay National Wildlife Refuge (mostly in Solano County), but I've never been able to figure out how you actually get to the Refuge. To the west, you can head back to Highway 101. The Atherton Rd. exit off of Hwy. 101 gives access to good birding at wetlands accessible from Bahia Dr. (Marin County). Head for the intersection of Bahia Dr. and Topaz Dr. A GPS address of 500 Bahia Dr., Novato, CA should get you close. 1600 Armstrong Ave. should take you close to good birding along Binford Rd., on the other side of the same area (heading toward Gnoss Field, a small airport here). Trails connect the two areas.